Win a $50 Gift Certificate to Monti’s! Congratulations to Jennifer Zaragoza on winning our fifth High Five Giveaway and thank you to all who entered! 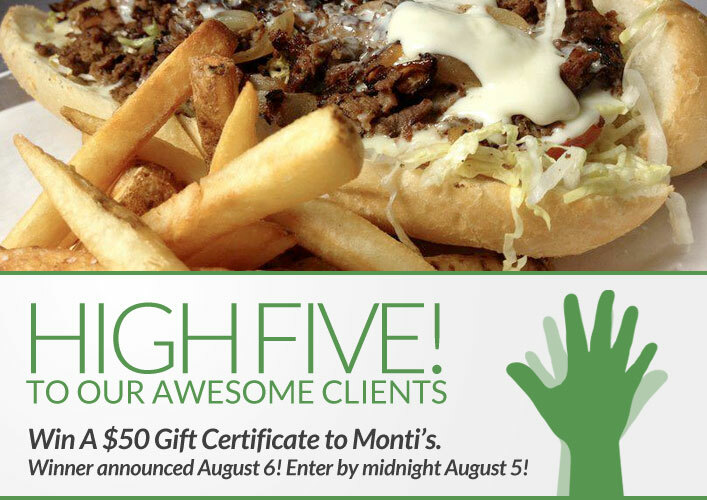 Our next High Five Giveaway is for a $50 gift certificate to Monti’s Restaurant. Chef James and Jennifer are both from Philly and while they love Chicago they missed their favorite foods like Philly Cheesesteaks, Hoagies and Tastykakes. Talk about an easy decision when coming up with a concept for their first restaurant together! Philly Cheesesteak Bar! Combining the best of both Philly and Chi-Town…the rolls are Amoroso from Philly and the Rib-eye is from the Midwest! What are the names of XEX’s two co-founders? Now, just add a comment to this post with the right answer to be eligible to win! The winner will be announced on Monday, August 6. Entries must be received by midnight on Sunday, August 5. David Perry & Gary Mattiazzi! David Perry and Gary Mattiazzi. Gary cuts my hair (love him)! David and Gary are the fabulous co-founders! David Perry & Gary Mattiazzi.